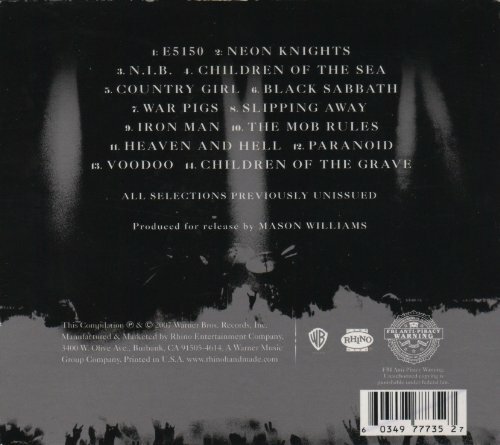 The Sabbath Stones (1996) is a compilation album of Black Sabbath songs taken from albums ranging from 1983′s Born Again to 1995′s Forbidden. 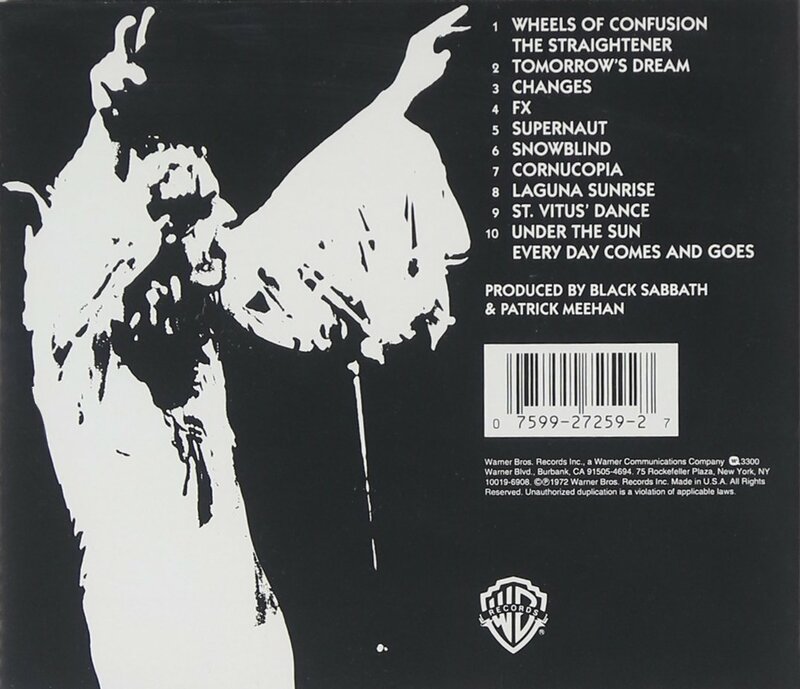 It was never formally released in the US or Canada, and was the last album to be released by Black Sabbath with I.R.S. Records. 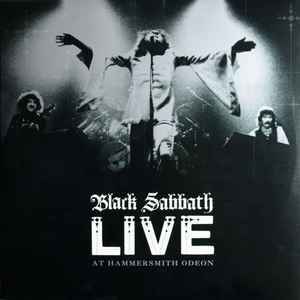 The best live recording of Black Sabbath from their glory days emerged on the internet only in 2001. It was a stereo soundboard recording that was made for broadcast on the popular ‘70s radio show, The King Biscuit Flower Hour. Recorded in August 1975 at the start of the Sabotage tour, the band was Ozzy Osbourne, Tony Iommi, Geezer Butler and Bill Ward. The original and best version of Black Sabbath. Asbury Park was a triumph in many ways. Black Sabbath was different from the heavy bands of the ‘70s in that they traded in Satanic images and invited the glare of the guardians of public morality. Led Zeppelin and Deep Purple were mild compared to the “hidden message” of Black Sabbath. The band don’t disappoint either. Straight off you can hear Ozzy shout a couple of “fucks”, hardly ever heard on a Led Zep, Uriah Heep, Free or Deep Purple concert from that period. For good measure, Ozzy even calls for a “muthafucker”, something accepted in movies today and also in gangsta rap but this was ancient 1975 in Asbury Park, New Jersey, where Bruce Springsteen was honing his skill as the man born to run. By Ozzy’s own account, there were countless times they had a hard time while touring the American heartlands with an act that enraged Christians. Tony Iommi lets rip on two long guitar solos, the extended Zabbra Cadabra [20 mins plus a Bill Ward solo] and the instrumental jam that includes Orchid and Rock ‘n’ Roll Doctor. Asbury Park also offers very tasty renditions of Black Sabbath classics War Pigs, Iron Man, Snowblind and Children of the Grave. Mostly the gig was to showcase their previous album Sabbath Bloody Sabbath and the new one, Sabotage, not yet released at the time of the concert. Like proto-punks, Black Sabbath lyrically were anti-war and anti-authority. It is to their credit that they survived the ‘70s long enough to establish heavy metal as something beyond just loudness, guitar riffs and posing. Children of the Grave and War Pigs were message songs and Black Sabbath’s satanic image was a mirror that reflected the anti-war message. No other metal band from that period took such risks with message-laden songs. Try to imagine wearing black in $ingapore, playing heavy metal and saying “muthafucker” on stage while playing anti-government songs and you will know what Black Sabbath had to go through for their music to be accepted. It’s a pleasure then to hear Ozzy work the crowd for the encore, a classic rendition of their only hit, Paranoid. This is the 2cd deluxe version. You are currently browsing the archives for the Black Sabbath category.